Background: Monoamine oxidase (MAO) is a critical target used for the cure of neuropsychological diseases. Objective: A series of quercetin based derivatives was designed, synthesized, and evaluated as novel multifunctional agents against monoamine oxidase A and B with antioxidant potential. Methods: Hybrid derivatives based on quercetin were synthesized and screened for hMAO inhibition along with antioxidant activity. Molecular docking was performed to explicate the rationale of the different MAO (IC50) values and to explain the presence of inhibitory activity against specificity, respectively. Results: The results of in vitro hMAO inhibition showed that compound 8a, 6c, and 4 were found as potent hMAO-A inhibitors whereas compounds 6b, 6a, and 6d were observed as potent hMAO-B inhibitors. The DPPH radical scavenging activity showed that compounds 6b, 6a, and 4 exhibited a promising antioxidant potential with IC50 values 5.931±0.007, 6.421±0.037, and 8.516±0.098 respectively. Moreover, the compound 6b, 6a, and 4 exhibited remarkable H2O2 scavenging potential with IC50 values 05.80±0.004 µM, 06.20±0.009 µM, and 07.66±0.009 µM respectively. Conclusion: The results of docking studies were found in good correlation with experimental MAO inhibition studies. 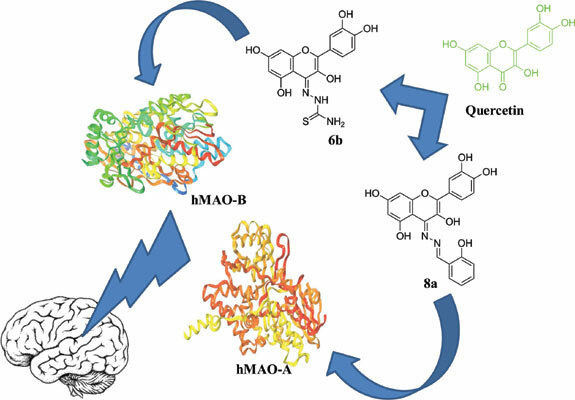 Moreover, the mechanistic insight into the docking poses was also explored by binding interactions of quercetin based derivatives inside the dynamic site of hMAO-A and hMAO-B. It was also noticed that the potent MAO inhibitors were also acting as better antioxidants as evaluated through DPPH radical scavenging activity and H2O2 radical scavenging assay. Keywords: Neurological disorders, Monoamine oxidase, Quercetin derivatives, Oxidative stress, Free radical scavenging, In silico design. Keywords:Neurological disorders, Monoamine oxidase, Quercetin derivatives, Oxidative stress, Free radical scavenging, In silico design.